Nick Cave’s last documentary film, ’20,000 Days on Earth’, was a brilliantly experimental insight into the maverick artist’s creative process and mindsight as he recorded and released ‘Push The Sky Away’, so I was immediately on board for a similar release to support his latest album ‘Skeleton Tree’. It’s an infinitely sadder and more reflective film as a result of the tragic circumstances from earlier this year when one of Cave’s sons died in an accident near the family home in Brighton, and it turns this film into something different than it was perhaps intended as originally. Shot in a monochrome black and white by Andrew Dominik, the film has a more intimate feel as we follow Cave and his band as he attempts to record his new album whilst coping with an incredibly tragic loss. I was unfortunate enough to be on holiday when the film was originally released in cinemas, so I’ve had the opportunity to listen to the album several times ahead of seeing the film in an encore screening. The documentary showcases 7 of the album’s 8 tracks and it’s a wonderfully immersive way to experience new music, with the raw power of Cave’s vocals coming to the fore in the surroundings of a large cinema screen. Most of the music and lyrics were written prior to Arthur’s passing, but even with this knowledge it becomes hard to separate the results of the album with Cave’s mindset at the time, and ‘One More Time With Feeling’ really encapsulates the raw power and desperate emotion of ‘Skeleton Tree’ superbly. Dominik wisely chooses to direct the film in a more grounded fashion with limited showy or flashy stylistic choices, although the one standout is the sequence during the performance of ‘Distant Sky’ as the camera zooms gradually away from the studio until the studio, the town and the world become smaller and smaller in the camera’s eye. The film alternately switches between a conversational approach with Cave and members of his band and family, with the actual recording of the songs for the album, and both are equally insightful. It’s rare to see a musician give such candid access to himself, both physically and emotionally, and Andrew Dominik deserves great credit for drawing insight without ever being exploitative in the circumstances. 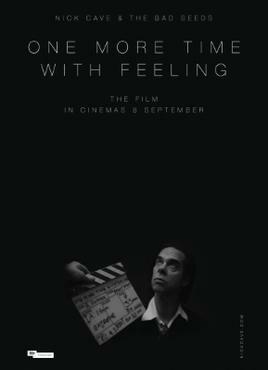 Nick Cave is one of my favourite artists, one of few capable of consistently producing interesting and varied music across a lengthy career, and ‘One More Time With Feeling’ is a moving and engrossing look into his latest work at a time of great tragedy in his personal life.